Does anyone have a gold basin claim map that they would share. planning on going up soon and don't want to step on anyone's toes. You might ask Bill about a 'Footprint Map for Gold Basin' ... he sells them I think in his store. not sure of the pricing for same. There are no commercially available "claims maps" that are accurate enough to legally determine the location of claims. The Gold Basin Footprints software is very good but is updated annually. It is a good starting point and along with County Recorder info, a good topo and LR2000 you can get current up to date data. You might also try Mylandmatters.org mining claim maps as a starting point. Thanks for the addition Stan ... I was very tired after a day at the GPAA show when I responded to that and totally forgot about 'mylandmatters.com'. AND I use that URL myself! All good places to start. Peakbager ... You might also try to hook up with one of the local guys who post on this forum and live in and around that area. If i were you I would post on the "Prospectors Lounge" sub forum requesting a little help from one of the local guys. Not everyone reads the meteorite threads. If you have a specific area I can zoom in and get you a claim pic. of your area. said, if you don't want to get a seat full of birdshot, it is wise to talk to the claim holder. Friendly equals safe. "That all valuable mineral deposits in lands belonging to the United States, both surveyed and unsurveyed, are hereby declared to be free and open to exploration and purchase, and that the lands in which they are found to occupation and purchase, by citizens of the United States and those who have declared their intention to become such, under regulations prescribed by law, and according to the local customs or rules of miners, in the several mining-districts, so far as the same are applicable and not inconsistent with the laws of the United States. That the locators of all mining locations heretofore made, or which shall hereafter be made, on any mineral veln, lode, or ledge, situated on the public domain, their heirs and assigns, where no adverse claim exists at the passage of this act, so long as they comply with the laws of the United States, and with State, territorial, and local regulations not in conflict with said laws of the United States governing their possessory title, shall have the exclusive right of possession and enjoyment of all the surface included within the lines of their locations"
This whole time I was really just a "newbie" without a clue about the fact that meteorites are neither valuable or mineral which is based upon... uh I guess you left that part out. 1. The lack of value of a meteorite? 2. The lack of minerals in meteorites? 3. Some law that supersedes the Mining Acts passed by Congress? 4. A Supreme Court ruling defining the meaning of an Act of Congress? The original Mining Act and interpretaions have changed over the years...one would have to be a Law Professor to completely answer the questions you ask. read the back posts to see many discussions regarding this issue. The BLM will not allow you to file a claim for meteorites. period. All questions must go to the Feds. Thanks for the considered reply Fred. The mining laws have been amended eight times. Not too hard to track the changes. Some minerals have been excluded in two different Acts of Congress - you will not find meteorites listed as excluded there or even mentioned in those or any other Act of Congress. There are no Federal Court decisions regarding the disposition of meteorites anywhere in the records. Not too hard to track that either. Those, paid by the taxpayer, that claim meteorites belong to the government, are no more able to change the current laws than are posters to an internet forum. Besides that policy memorandum (not law) expired on September 30, 2013, one year and 20 days after it was circulated. Obviously even the King's men know when they have no leg to stand on. I can find no basis in fact anywhere to lead anyone to believe that meteorites do not belong to the claim owner. Knowing that Ben has extensive knowledge of meteorites I assumed he must know something about their collection on mining claims that has not been made public. Considering that no actual laws or court decisions can be relied on to support the theory that meteorites are not the property of the mineral owner isn't it unwise to inform "newbies" that indeed one can take meteorites from a mineral claim? As far as the value argument - valid mining claims are made for many minerals that are of "little value" by the public's standards. Perlite, decorative stone and volcanic cinders come to mind. Each of those mineral deposits have been adjudicated as belonging exclusively to those who have located claims for deposits of them. It could easily be established that any meteorite would have a greater market value per pound than those minerals. I think where the disconnect comes for the meteorite collector and the claim owner is the difference in perspective. The claim owner knows the law has granted him exclusive right to the minerals on his claim. The meteorite collector doesn't primarily view meteorites as a mineral. Some have argued that meteorites can't be claimed - they are correct. Only the minerals in the meteorites are being claimed. The Barringer claims were located, perfected, mined and patented for the valuable minerals contained in the meteorites - not for the fact that they were more recently accreted into the earths mass than some of the other minerals found there. It would be helpful to consider than even though a mining claim may have been located for tin, gold, lead or even volcanic cinders it is well established in law that ALL the valuable minerals found on the claim belong exclusively to the locator. Even valuable minerals that have accreted from sources outside the claim boundaries are included in that ownership. I'm sure there will be many more discussions on meteorite forums about this subject. The simple fact that some meteorite collectors are unsure of the actual laws regarding mineral ownership does not void the already existing laws that clearly state the ownership of valuable minerals found within a mining claim is vested in the claimant. I would think a prudent man (even a newbie) would rely on the known facts to guide their actions rather than the slim possibility that a previously unknown law could be relied on to justify one's actions. They are (mistakenly) not considered a locatable resource, thus mining claims do not pertain to them. They are (mistakenly) covered under the Antiquities Act. As I stated above meteorites are not locatable but the minerals in them are very much locatable, have been located and have been granted patent by an Act of Congress. There is no mention of meteorites in the Antiquities Act but that's not surprising since only human activities or human material remains are the subject of that Act. The term "archaeological resource" means any material remains of past human life or activities which are of archaeological interest. There is no connection between the Antiquities Act and meteorites. The fact that the Antiquities Act is often raised in these discussions is probably due to the myths surrounding the Old Woman case. That case did not address meteorites but internet myth continues to circulate that it did. You're trying to be clever. The government doesn't like you being clever. While what you are stating is factually not incorrect, it's not how things currently work. What you call myth I call case precedence, and until another court case comes along this is what we're stuck with. anybody that asks a question when they think they already have the answer is way too clever...in my opinion. Oh, while I don't disagree with what you write I don't have the legal background to research what you call facts...but, it is fun to read your opinions of the Law. And if it ain't so, it ought to be. Looks like I will be treading lightly and being nice. Oh and thanks for all the input guys I appreciate it. It's always a good choice to tread lightly and be nice Bryan. Most claim owners would probably give you permission to hunt meteorites on their claims when politely asked. The area you want to hunt is also known for gold nuggets so the conflict is obvious. 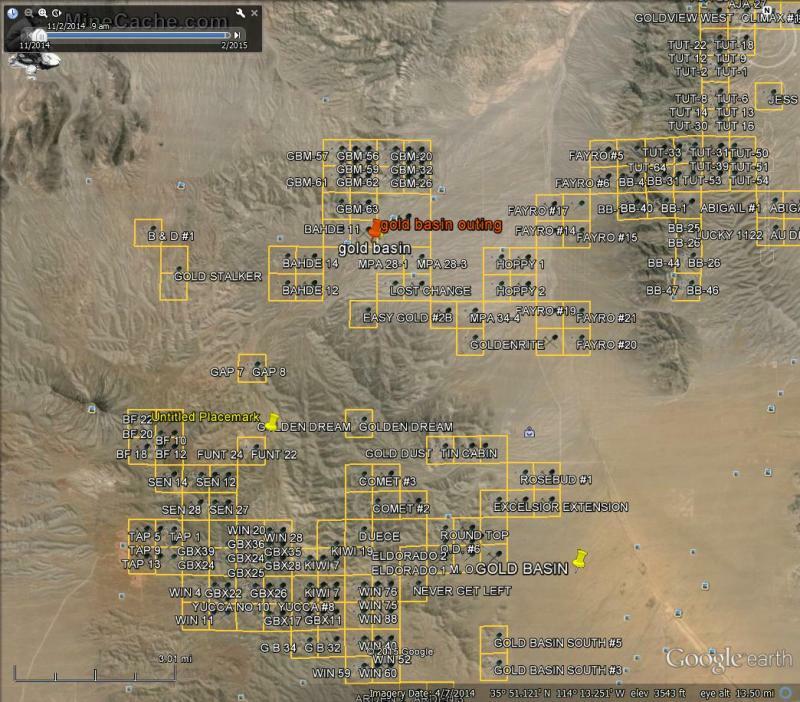 Right now 29N 18W Sections 16 & 17 are all claimed up with lode mines. Sections 11, 15, 19, 21 and 29 are private property as well as portions of Section 9. PM me with your preferred location and I'll share what I know of the claims status there. No fun looking over your shoulder anyway. Someone with a metal detector on someone's gold claim will get their attention legal or not. Better safe than sorry! For Fred and all those who wish to review the Old Woman case here is the link. Of course the case set no precedent in mining or mineral law because it was an appeal from an administrative decision regarding a permit. The case was about whether the Secretary of the Interior could issue a permit without following the administrative procedures found in the Code of Federal Regulations. No law was being challenged or judged, just administrative process. Here is the synopsis of the cause direct from the 9th Circuit statement. The State of California and the San Bernardino County Museum appeal the dismissal for failure to state a claim of their suit which sought to declare invalid a permit issued to the Smithsonian Institution under the Antiquities Act, 16 U.S.C. § 432, for removal and study of the "Old Woman Meteorite." They also appeal the denial of their motion for a preliminary injunction to enjoin removal of the meteorite from the State of California. The case had nothing to do with enforcing laws or the ownership of any meteorite. It was a simple administrative permit appeal that failed at both the District and the Circuit courts. None of the parties to the case ever raised the issue of ownership. Only the proper administrative process to obtain a permit from the Department of the Interior was challenged. Both courts decided those suing to force denial of the permit had no grounds to sue on and in both courts the case was dismissed. When cases are dismissed no precedence is established. Under the law the Old Woman case is a nullity. Meteorites are natural objects originating in outer space that survive impact with the earth’s surface. The extra-terrestrial origin of meteorites, as well as their relative rarity,has made them highly desirable to casual collectors, commercial collectors, and scientific researchers. Previously, the BLM has not formally addressed rules regarding collection of meteorites on public lands. However, recent media attention has increased public interest in meteorites as well as confusion about the legality of and limits to casual and commercial collection. Courts have long established that meteorites belong to the owner of the surface estate. Therefore, meteorites found on public lands are part of the BLM’s surface estate, belong to the Federal Government, and must be managed as natural resources in accordance with the FLPMA of 1976. Meteorites do not meet the definition of a mineral resource under the general mining and mineral laws. Therefore, mining claims cannot be located for meteorites. We all know where the fence is. Don't go over it. We all know that there is private land in Gold Basin. We should have permission to be legally collect even on the subdivision lots because the owners of the property also bought the meteorites with the land. The private owner may or may not have the mineral rights. Those may have been retained by a mining company. Clay could tell us who has them. Most of the private owners have not developed their lands and have not specifically objected to meteorite hunters going up and down those streets. This still does not mean it is legal and if someone says you are on their land then I will leave but I will also avoid the few developed lots that are out there (most of them are on the Dolan Springs side of Gladiola Road). It is an area near where Frank C and Bunk have their claim. We all know that there are club claims there and they are marked very well. I belong to more than one of those clubs (GSSN, MPA, GPAA). They have 'rules' which request that some form of current membership be displayed on the individual and the vehicle. As a club member I would like to see the gold taken off of it be gathered by another club member but it is not my job to enforce club rules at the risk of personal injury. There are claim jumpers out there and they feel justified in doing it. This started long before I ever went to Gold Basin for the first time in 2010. I've never had a problem in the basin but I have been warned not to go into certain areas where there are active mines. There are plenty of places to hunt meteorites and gold without going there. Most of you who have already commented on this thread have much more experience in Gold Basin than I do. If you have a specific area of warning for the rest of us please let us know. There are currently no claims on any of the known or unknown meteorite strewnfields in Arizona. That means you can claim them all for yourself, scoop us all, and be rich. How many dollars per ton do you expect in the pay-layer? The Spanish mined here from the late 1500's til the 1830's. They kept meticulous records on all mines because the King received one fifth of the net output, yet there are no records in Madrid or Mexico City for any mine of that type. yet, we know that THEY knew where meteorites were. They used a huge iron meteorite for an anvil at the Tucson Presidio, not once, but twice. Yet there was no mine. The Holbrook meteorite fall occurred more than 100 years ago when the State was in a huge mining boom, yet no one claimed, or mined that strewnfield any time since. Also, keep in mind that meteorites even though they may have metals or minerals, coming from outer space, are not a NATURAL feature of the land. I have never seen a documented meteorite lode or placer. If I were to find buried gold coins out in the desert, would I be able to file a claim because gold is a valued, mined, metal? Is that gold locateable? Is it a natural feature of the land? If I found a swath of debris from the Apollo 17 disaster, would I be able to claim the land for the titanium, and other valuable metals used in the Space Program? Yes meteorites are valuable, but I think that if you really believed that they were claimable, YOU would have already filed those claims. That said, if anyone uses a metal detector on someone's claims, they should notify the claim owner first. Don't forget that unless the claims have been patented as private property, you can also hunt, fish, ride, cut wood, dirt bike, camp, play baseball, or look for meteorites on any mining claim on public land. The Spanish mined here from the late 1500's til the 1830's. They kept meticulous records on all mines because the King received one fifth of the net output, yet there are no records in Madrid or Mexico City for any mine of that type. yet, we know that THEY knew where meteorites were. They used a huge iron meteorite for an anvil at the Tucson Presidio, not once, but twice. Yet there was no mine. The Holbrook meteorite fall occurred more than 100 years ago when the State was in a huge mining boom, yet no one claimed, or mined that strewnfield any time since. Also, keep in mind that meteorites even though they may have metals or minerals, coming from outer space, are not a NATURAL feature of the land. There are literally hundreds of claims where there are known strewnfields. Gold Basin is a good example. Mining claims may be based on the discovery of a single mineral but once located all the valuable minerals become the exclusive property of the claim owner. You should look a little closer at land status, and the laws that create that status, before proceeding to look for minerals no matter how recently they accreted. The word meteorite was not coined until 1818 and the concept itself was in dispute well into the 20th century. The Spaniards obviously did mine meteorite material at least to the extent of using the material for anvils. The original famous Spanish Toledo blade steel and the Arab Damascus sword steel were made from "wootz" metal sourced from a huge meteorite deposit discovered near Hyderabad, India more than a thousand years before the Spanish came to the new world. It's a historical fact that the Spanish recognized the valuable nature of the metallic meteorites whether they knew their genesis or the name that they would eventually be assigned. ALL mineral components are accreted from outside the earth. There are no elements being created within the earth. It is accepted science that all the material the earth is composed of was accreted from space. Hard to get more "natural" than that. If minerals accreted from outside the earth were excluded from mining claims there would be no mining claims at all. I have never seen a documented meteorite lode or placer. Here is the approved mineral survey for the meteorite mineral discovery. Here is the 640 acre mineral patent granted for that meteorite mineral discovery. If I were to find buried gold coins out in the desert, would I be able to file a claim because gold is a valued, mined, metal? Is that gold locateable? Is it a natural feature of the land? If I found a swath of debris from the Apollo 17 disaster, would I be able to claim the land for the titanium, and other valuable metals used in the Space Program? Yes meteorites are valuable, but I think that if you really believed that they were claimable, YOU would have already filed those claims. As I've written several times meteorites are not locatable but their minerals are. Claims can not be made for coins, plastic toys or abandoned boots either. Obviously valid perfected claims can be, and have been, made on meteorite minerals. In some states you might be permitted to look for meteorites on mining claims as long as you don't remove them. In Arizona it appears to be criminal trespass to even look for meteorite minerals on a mining claim. Of course you could try to argue with the Judge, after the fact, that Iron, nickle and about a dozen other minerals really aren't minerals because they came from outer space. I doubt that argument would get much traction.